Paniala is a native of India. It is met with in the Northern Uttar Pradesh, Assam, Bihar and Orissa in North India and some parts of South India. 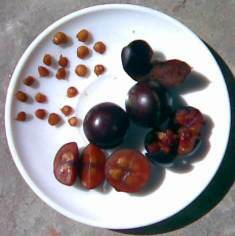 It is also cultivated on a very small scale for its fruits. A small, much branched dioecious shrub or a spreading tree, 20-30 ft high, with sharp decompound spines on the trunk. Leaves obovate or elliptic, 3-7 cm long, glabrous, crenate or crenate serrate towards the apex, lower portion entire. 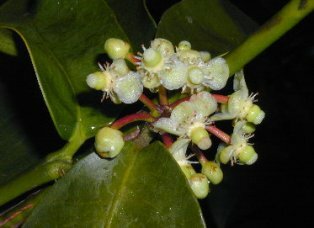 Flowers dioecious, in shortly branched glabrous racemes,; male flowers solitary or in clusters; female flowers solitary; sepals, 4-6, pubescent, ovate, 4-5 mm long in male flower; in female flowers sepals are orbicular; stamens 3-5 mm long; disc lobes 4-6, rounded, styles usually 4-6. Fruit an ellipsoid berry, 2.5 cm long, dark red or purple when ripe. There are, however, many races of this species varying in fruit quality. The fruits are eaten. Thy have a pleasant tart flavour. The flesh is firm, brownish green and fairly juicy. Sometimes the fits may be astringent. The fruits can also be used for making jams, preserves and marmalades. The wood is red or orange red, close grained, rather hard and brittle. It takes good polish and is used for agricultural implements or for block sheaves. The leaves and young shoots, which taste like rhubarb, are astringent and stomachic. 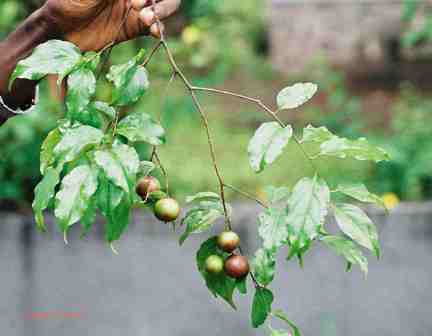 The leaves and bark are useful for bleeding gums and toothache. An infusion of the bark is used as a gargle. The fruit is recommended in bilious conditions. New plants of paniala can be raised from seed. This is a multipurpose useful plant, so its cultivation should be encouraged. This species should be included in various tree plantation programmes.